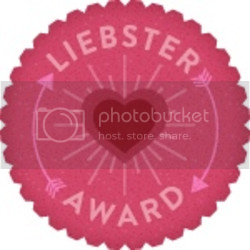 You may have seen Liebster Awards swirling around in the blogosphere. It's probably the best virus there can be... no harm at all and fellow bloggers spread the good cheer! "A Mom's Musings" was recognized by two fellow moms and I totally procrastinated on passing this Liebster award on! Not only I have procrastinated but I had to stop numerous times during the course of putting together this blog post to hug a kid or two, warm up a sippy cup of milk, talk about the rare rainy weather, play referee, transfer the TV remote from one kid to the other, pull out one kid who tipped over head first into an deep enclosed space, change a diaper and hug and happily play with that kid. Now I will tell you which blogs I nominated and it's totally up to the nominees to procrastinate as well or just accept the gesture! I know how busy we can get so don't feel bad at all if you can't pass it on; just take it as a PR thing for the great work you are doing with your child/children. I have combined the answers sections from both awards and it's up to the nominees to use one, both or come up with something completely different. 1.) Link back to the person who nominated you and thank them. Thank you both for the hat tip! Sorry for taking so long. Even while I put it off, I continued to enjoy reading your blog posts. - Jessica, mother of Tommy, at Thomas Marshall Does It All. - Shannon, mother of Oliana, at I'm Fine But My Mommy Has Issues. My pet peeve is when one summons attention by blinking the overhead lights in a room of Deaf people, that summoner keeps the lights off too long in between and draws out the blinking, too. My single lowest score on country name/map tests during my 6th grade year was 98%. I still have the wrinkled, tattered certificate saying I averaged 100% for the entire year, signed by Mrs. Thompson at College Place Elementary School in Edmonds, WA. Transferring to Washington School for the Deaf (residential school) during my 7th grade year was the right thing to do for me. It was there that I grew into (well, I think!) a well-rounded person because WSD nutured more friendships, confidence, teamwork, independence... and mischeviousness. I love to play volleyball and participate in throwing events in Track and Field (usually hammer and discus). I've always enjoyed writing but I never dreamed I'd do far more writing as I've done in the last two years. My children, especially Orion, are my muses. If it's not in a blog post, it's in a journal. I'm in awe and touched by a whole new community... so vast it's like a new dimension.. of individuals, family, friends and professionals in the Deafblind and special needs community and education field. I never knew you could still meet so many more people and I'm glad I have. I'm not alone, my family is not alone, and all the other families I've met, read and talked with are not alone either. I love hearing their stories and sharing Orion's story. What kind of music do you like? Nearly anything danceable that I can nod my head to the beats. If there's something on the radio I like, that's all I can do.. like it. I have no idea the song, the singer/band, the lyrics... no idea. If I really really really wanted to know, like I did once, I'd call up the radio station and ask them what was played at 7:49 a.m. I enjoy pop, grunge, alternative, salsa, jazz... Michael Jackson, the Beatles, en Vogue and occasionally classical music... it's the CDs or music I have on my iPod. By the way, I've played some Michael Jackson for Orion and he enjoyed it! What is your favorite holiday and why? I have to mention two: Halloween and Christmas. Halloween because we can dress up! I love Halloween decoration, attire, activities for children... and candy. I'm just sorry it's too scary for some children... it's supposed to be fun! It's the fun-giver's responsibility to keep it kid friendly! Personally, fake gore doesn't creep me out. Christmas is where I love checking out the holiday lights, holiday parties, putting lights up on our own home, putting on some Christmas CDs and DVDs, shopping for gifts (especially for children), the smell of the tree and hanging of ornaments, winter holidays with the kids home from school, taking care of Santa evidence and the kids' excitement on Christmas morning. Have you changed since you became the parent of a child with special needs? I met so many more awesome people: DB individuals, families, professionals... online, and particularly in the last year at TSD, at DBMAT Family Weekend, workshops and the Texas DB Symposium. I also learned so much more about DB children and adults, braille, early literacy, technology and equipment, support services at school and in the community, communication and instructional strategies. Time does become an issue for me when I want to work on my own projects. How do you handle "advice" from strangers? If I understand, I say, "Thank You." If I don't, I ask them to repeat what they're saying or if I still don't understand but am getting that this is just unsolicited advice, I'll say something like, "It's OK. Thanks anyway," and continue on my way. What kind of support is lacking for your child or their kind of special needs? Interveners at home (one-on-one professionals trained in Deafblindness.) whether it is in practice, expected or not... I believe this is what we all need, especially Orion. When I am writing or on the computer, I am definitely not giving Orion opportunities to connect to the going-ons in his environment or paying attention to my husband and kids. Let's say you have a whole afternoon to yourself and $100 to blow. What would you do? (And I mean fun, not go buy groceries.) Like my husband says for himself, I totally forgot how to shop so I have to really rack my brain about this. We used to hit malls before we had kids. I can see where our financial flow goes instead these days. If I had this money to blow, I'd probably go to Home Depot and/or Michael's Arts and Crafts and start a DIY or art project... or I'd go buy some new clothes. Name a cancelled show that you used to love to watch. "Whose Line Is It Anyway". Hilarious, wacky, spontaneous, surprising and off-the-cuff humor... guaranteed laughter from me! Are you a big city, small town, or country person? I think I may be a small-big city person. This city MUST have a body of water. Family nearby is a humongous plus... so water + family = Seattle, WA. I am happy with Austin, TX... my new city has many awesome ingredients minus family and mild weather. What was the last concert you saw? One of those Sundays last summer at Seattle's History House Music in the Sculpture Garden Summer Concert Series (Sundays, 2-4 p.m., June through July). Fine local music to enjoy among off-the-wall sculptures and friendly off-their-rocker people. How long have you been blogging? I've been journal writing all my life with on and off periods. It just moved over to the digital format sometime after my first son was born in 2004. I posted pages of pictures of my kids for family in Washington state to see (I was living in Maryland) and then I discovered xanga.com and finally, blogspot.com where I created "A Mom's Musings" in 2009. What's your favorite edible treat? Gosh, I love food. It's hard to pick just one. What comes to mind right now are big juicy, freshly picked raspberries. 3b. Part II) Create 11 new questions for your nominees. Where on this planet would you like to visit that you've never gone to before? Where have you gone before that you just have to go back and visit? Have you ever met a person with your or your child's disability before your disability became obvious/your child was born? Is there something or support you or your child needs that you don't have right now? What's your favorite hobby to do if you actually, miraculously have time to do it? What is one of your favorite things to do between yourself and siblings or you child and his/her sibling(s). You're awake late into the night. Is it insomnia, your kid, or you creating your own free time since everyone else is asleep (that you'll pay dearly for later)? Kodiak, My Grizzly, blog written by the mother of Kodiak, an adorable boy with CHARGE syndrome. CHARGE is the most frequent cause of deafblindness in children. The Independent Little Bee, blog full of ideas and accessible activities written by Robbin, a vision guru who also has several years of experience teaching deafblind children. I would call her a COBA (Child of Blind Adults) because her mother is blind; just like I'd say my daughter Anastasia is a CODA (Child of Deaf Adults). The Socially Inappropriate Mom. Rachael is a brutally gracious, honest mother of two young daughters. Her oldest, Daisy, has an autism spectrum disorder and her youngest, Aria, is deafblind along with other health issues. Tactile the World, written by Christine "Coco" Roschaert, an inspirational Deafblind woman who's been around our globe, trekking and or giving inspirational, educational and empowering presentations in different countries. I first met Coco when we both were at Gallaudet University. An Exceptional Life, I just 'met' Melinda, who blogs about her blind son, Logan. What's funny is that we both blogged this month about our sons being "nudists"! 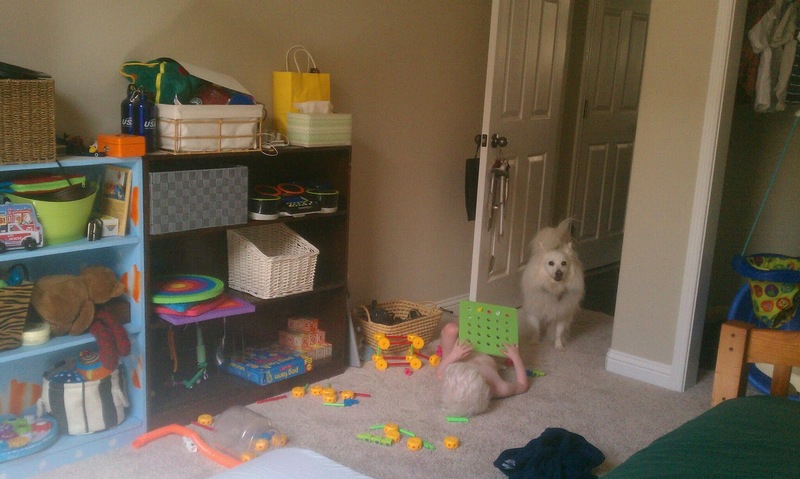 Her last blog post is appropriately titled, "Little Houdini". That's what I called Orion, too. Just Another Ordinary Miracle is a blog written by Ivey's mom, Gwen. I've been following Ivey, who is also deafblind, online ever since Orion's infancy days. I have to mention a friend I've been following on Facebook: Cat Valcourt-Pearce. I met Cat when we both were students at Gallaudet University. She and her husband, Larry, just welcomed their twin boys to their family this month. They're still in NICU, born premature, being closely watched and working on becoming Mr. Universe contestants. The twins have two big brothers, one who has Phelan-McDermind Syndrome. Cat's sense of humor is totally entertaining with reality of family life and disabilities wildly streaked with wit. In lieu of a blog, please read a Washingtonian article "Remains of the Day" by Matt Mendelsohn, which features Cat and her growing family from a wedding photographer/friend point of view. An excellent read, you will not be disappointed. I was hauling a bucket of fresh kitty litter from the garage to the master bath. * Thomas' mom, who was visiting for the weekend, stopped me in my tracks when she said there was something wrong with her recliner. Down went the bucket as I kneeled to investigate. Right away, Skyler started to yell excitedly from the open stairway, signing toward the master bedroom,"O-T! O-T!" I ran, thinking it was another streaking Orion episode. Orion was still in his diapers, about to finish climbing onto our bed. He was on the carpet when I left him! I finally saw just how Orion was able to get up from the floor onto our bed. Check out my celebratory Smilebox of the photo evidence. The New House: Our Limbo Is Finally Over! 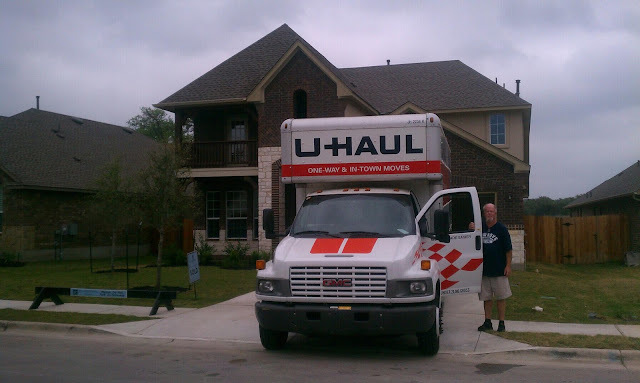 A 28-foot Uhaul truck we stuffed with unfortunately just most of what was in our not-missed 3-bedroom apartment was sitting there glaringly in our new neighborhood. At that time we had moved out of our apartment into a basic motel for 5 days. The rest of our stuff sat in a friend-family’s garage. “Yes," was the representative's reply. The sales representative (who we were in constant touch with), builder, design center consultant were knowledgeable and pleasant to work with. If you need to have your home built, check out Standard Pacific Homes and they’ll take good care of you. I don’t work for them but I can vouch for them based on our experience with them. Our realtor, Sarah Suftin, was efficient, too. As expected and to our satisfaction, we had an inventory of houses to visit throughout Austin and some out west in Dripping Springs (A.K.A. "To the west of Weird"). My parents also flew in to spend time with us, the kids and helped us pack and clean the apartment, provided logistical support when it came to picking up Orion and helped out at the new house. Thanks, Mom and Dad! 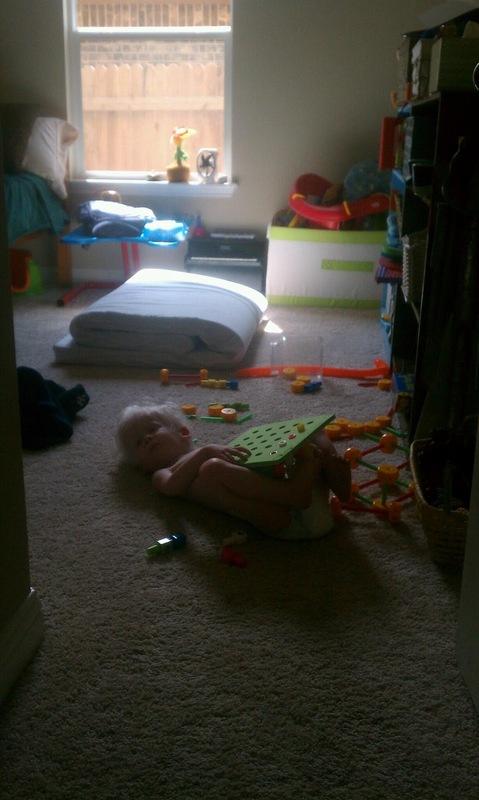 The plan for Orion's room is to have everything set up in their "forever" spaces so when Orion seeks, he shall find. Note the wind chime on the doorknob, jumper hanging in the closet doorway and Falkor supervising. There's so much more space here than the apartment. Orion seems to be relishing in it along with the rest of us! He continues to make progress especially in scooting around on his back in his new play room, finding things to touch and explore further. Lately, when we pull him up into a seated position, we're seeing him tucking his chin into his chest. An itty-bitty milestone for any kid but a HUGE one for Orion! The difficult part of this was that it felt like forever waiting for the home to be built. Just like any other customer, I'm sure! We frequently drove 12 minutes south from our apartment to check out and delight in the progress. Our home was ready on April 8th. We were finally going to be able to let our guts out a little by a few belt notches after the apartment. The apartment management found creative ways to charge us way beyond our $500 refundable deposit. The comfort and space of our new home takes some of the sting out of the move-out checklist fiasco. (Always take pictures at move-in and move-out! For your own defense and/or remind you of how things were before move-in.) I'm not going to give them the pleasure of 'negative publicity is still publicity'. A month into our new home, we’re still dealing with unpacking the consequences of our materialism. Packing will remind you of how much you don’t need! I have to say we did have two yard sales as well as listed items on Craigslist and FreeCycle before we moved. Clearly, we have to consider doing some more here in Austin! If you took a peek in our clogged garage/unpacking area, you'd think Santa Claus lived here when it's not Christmas. We usually go all out with holiday lights every year. We look forward to doing that on our new home. The City of Austin (utility) will be so happy with the extra revenues flowing in from our address. Now for the biggest, overwhelming item on our family agenda: Our backyard. It's an empty dirt canvas with weeds sprouting up into an organic Jackson Pollock. A river runs through it diagonally when it rains like heck. The ideas are childrens’ (and adults’) dreams yet to be realized, funds yet to be depleted, priorities yet to be tested, swings yet to be hung, accessible playhouse yet to be built, kiddie pool yet to be inflated and splashed in, kitchen (and sensory) garden yet to be planted.... Yet to be enjoyed fully by family and friends. A special shout out from us to realtor Glen Sutcliffe, for his help in selling our old home in Glenn Dale, Maryland back in July 2012. We got the "right offer" in under a week's time on the market! I'll be back very soon with yet another A Mom's Musings post. The day is finally here. This is while all 3 kids were in school. I kid you not when I say the truck was fully loaded, front to back, bottom to top with two extra boxes on the passenger seat. Orion's resonance board (flat, 4' x 4' wood square) barely fit in on top of all the stuff back there!